Since being elected to Congress, Alexandria Ocasio-Cortez, the 29-year old former Bronx bartender and self-described democratic socialist, has been a breath of fresh air for millions of working-class people. Her first action in D.C., after winning her November election, was to join an occupation by environmental activists inside Nancy Pelosi’s office. Shortly afterward, she tweeted her disgust at being forced to listen to lectures of CEOs at an orientation for new members of the House. AOC, as she is nicknamed, exposed the problem of unpaid interns in Washington, pushed back powerfully at sexist and racist abuse from Republicans, and built a following of 2.4 million people and counting on Twitter. On 60 Minutes in January, she floated the idea of a 70 percent marginal tax rate for the super rich to the horror of the corporate establishment. AOC has given confidence to workers and young people to fight for Medicare for All, a green jobs program, free college, and more. Her massive support points to the potential for powerful movements in the period ahead, particularly as capitalism goes further into crisis. AOC’s first several weeks have also done an enormous service by revealing obstacles that stand in the way of achieving change, especially from inside the Democratic Party itself. This was most clearly demonstrated after Bernie Sanders called on Democrats in the House to oppose Nancy Pelosi’s “pay-go” rule that requires any spending increases passed by the new Congress to be accompanied by corresponding cuts. AOC, along with left Democrat Ro Khanna, vocally opposed the rule and warned it would prevent the passage of the progressive measures like Medicare for All. Their stand won widespread support from the grassroots, but only Tulsi Gabbard ended up voting with them. Rashida Tlaib, Ilhan Omar and Pramila Jayapal couldn’t be counted on, unfortunately. “Some lawmakers with ties to Ocasio-Cortez are hoping to coax her into using her star power to unite Democrats and turn her fire on Republicans. Others simultaneously warn Ocasio-Cortez is destined for a lonely, ineffectual career in Congress if she continues to treat her own party as the enemy” (1/11/19). It’s absolute nonsense that AOC is “destined for a lonely, ineffectual career” by fighting in the direction of what working people need instead of catering to the interests of corporate politicians. By not playing by their rules, she has become one of the most popular politicians in a short time. Her first House speech was shared by so many online that it quickly became CPAN’s most-viewed clip ever! The biggest danger for AOC is not that she alienates corporate Democrats, but that she fails to use her position to help build a much larger fight of working people. The only way to overcome the “paradox” and win far-reaching change is to rely on organized mass movements outside Congress. From this perspective, AOC has made some mistakes. Most importantly it was a mistake to vote for Pelosi for House Speaker, which allowed Democrats on the right of the party to be the main opposition to the highly unpopular and pro-corporate leader. In the end, this got AOC nothing – the special committee she hoped to get for a Green New Deal was ultimately killed by Pelosi. It’s not by persuading pro-corporate politicians that we win change. Historically, change has been won when mass movements of working people – such as the wave of industrial strikes in the ‘30s and ‘40s and the civil rights movement have posed a serious threat to the capitalist status quo. We need working-class representatives who use their elected positions as a platform to assist working people to organize and actively fight back in a really big way. Running more socialist candidates is critical. But we don’t have to wait for elections. 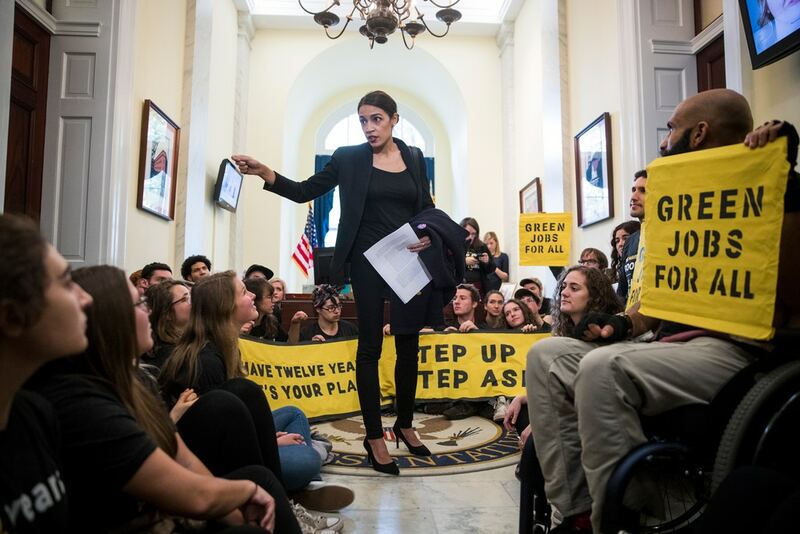 If AOC were to call for mass demonstrations around key issues – for example Medicare for All, funding public education, the Green New Deal – she could help build the kind of organized, mass working-class action needed right now to speed up change. To develop a democratically organized and diverse movement of working people, AOC along with Bernie Sanders and others could bring together tens of thousands of their supporters through conferences in every major area to discuss the way forward. Such meetings could involve activists from unions, immigrant rights groups, socialists, anti-racist groups, and more to develop a plan, including rebuilding the power of organized workers, to turn the tide at every level against the billionaire class. We would encourage AOC to not just see her role as that of a “weathervane,” only able to point in the right direction if working people themselves are the “wind.” Instead she is in a unique position to lead from the front and point in the needed direction – like a compass – to help prepare a new generation as fast as possible to win. At this stage, AOC is mainly basing herself on a electoral and legislative strategy, limited to getting more progressives elected and aiming to transform the Democratic Party over time. AOC has shown that there is indeed space to build support for pro-worker and socialist ideas inside the Democratic Party, but there are real limits. The “carrot and stick” campaign against her shows this. The Democratic Party party is not a reliable tool for working people, to put it mildly. It is in fact dominated by big business. The establishment will not let their party be taken over and transformed so easily. To defeat the entrenched corporate leadership of the Democratic Party, it will take a huge confrontation against them and their big business backers. A new party is ultimately needed. AOC has shown the potential to win the support of millions of working-class people around important fighting demands that would make a huge difference in the lives of many if won. However, like Sanders she does not challenge the existence of the capitalist system itself and believes that all that is needed is radical reform. But while important reforms can be won and would increase the confidence of working people to fight for more, we will never be able to turn capitalism into a system that works for ordinary people. In fact the longer it exists the more destructive it is likely to be. Building a movement now around a fighting program is just the start of a process that must lead to the development of a revitalized labor movement and a new mass working-class party that fights for far-reaching socialist transformation.